Having opened his own workshop in 1855 (see part 1), Postiglione rose to prominence in the Naples of the mid-1870s; this was likely due not only to his abilities as a violin maker, but also as a businessman. Giuseppe Desiato, Alfonso Della Corte (c. 1834–1884) and Francesco Verzella (1840–1928) worked contemporaneously with him, with varying degrees of professional success. They were, however, not nearly as productive and their best examples are mysteriously rare (in particular those of Verzella), no doubt in part due to relabeling and ‘upgrading’ to grander, older Neapolitan names. While Desiato’s work is generally quite rudimentary, that of Della Corte ranges from rather rustic to quite refined and beautiful – it is more in line with the earlier Neapolitan makers than Postiglione’s. Paradoxically it was Postiglione’s very close contemporary Della Corte, not Vincenzo Gagliano, who was his main competitor. Della Corte and Vincenzo Gagliano died in 1884 and 1886 at a time when Postiglione’s career was really taking off. By then he had become the most influential violin maker of the modern Neapolitan school. 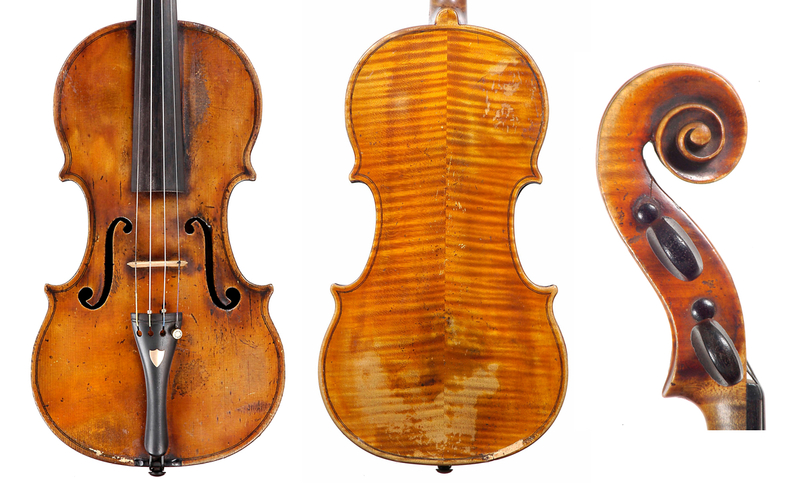 While more or less cornering his city’s still fragile, post-Risorgimento violin market, Postiglione was one of a handful of makers in Italy of that period to have produced instruments of a consistently high calibre – the others who managed to achieve recognition were working in the north. During the late 19th and early 20th centuries, thanks to the growing popularity of opera productions by great Italian composers such as Verdi and Puccini, and a partial recovery in the local economy, production of new stringed instruments began to boom. Capable craftsmen joined the violin making profession around Italy, and Naples turned once again into a busy violin making town, with production returning to levels seen in the 18th and early 19th centuries, and not far below those in Milan and Turin. But until then, Postiglione continued to work virtually competition-free in Naples. Even the emergence during the 1880s of the talented Giovanni Pistucci, a presumed former Postiglione pupil, did not really challenge his pre-eminent position. Much of Postiglione’s production predates the trend in Italy to artificially age the varnish – either to facilitate sales of new instruments or to fake the work of predecessors. In the north, makers of Postiglione’s generation such as the Scarampellas, Enrico Rocca and Marchetti shunned artificially ageing their works, though some of them appear to have believed that the use of ancient wood added pedigree to their instruments; in a fine 1885 example, Postiglione mentions on the label that the top was made of wood dating back to the 15th century. In Naples, faking and copying was pioneered by Pistucci and later adopted by Vincenzo Sannino. Pistucci perfected the art of fakery to such a level that his copies of earlier 19th-century Neapolitan makers still often pass for originals. Postiglione’s numerous instruments from the early to mid-1880s represent the peak of his career and are indeed some of the very best made in Italy of the period. They combine simplicity with an inherent know-how, at times at the expense of elegance, in a way that among his contemporaries warrants comparison only with the work of Stefano Scarampella and the early period of Enrico Marchetti. His wood was always of the best available quality, with little variation in his choice of highly figured two-piece maple backs, devoid of any pinning. 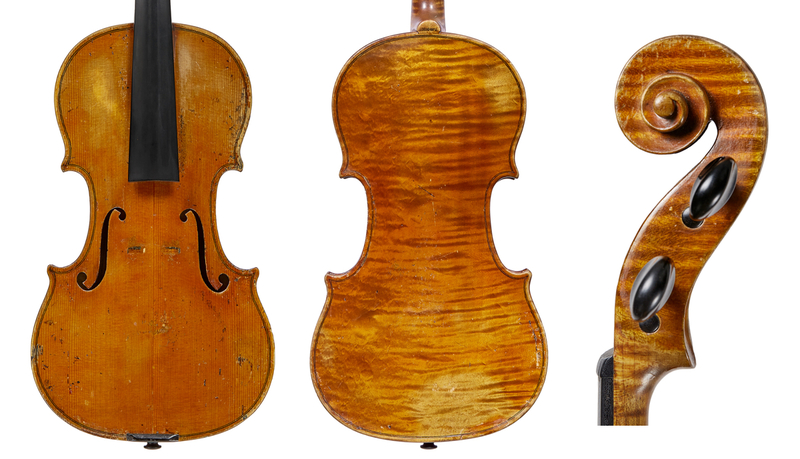 Only in some of his late-period violins did Postiglione use highly flamed one-piece, slab-cut maple backs. The slightly fluted, generally widely positioned f-holes are cut on Stradivari or Guarneri ‘del Gesù’ patterns. The scrolls, however, are not in line with the f-hole pattern and are quite characteristic and recognisable, generally with rather striking round or slightly flattened eyes; the backs of the scrolls are shallowly carved and often end in an uneven center ridge. 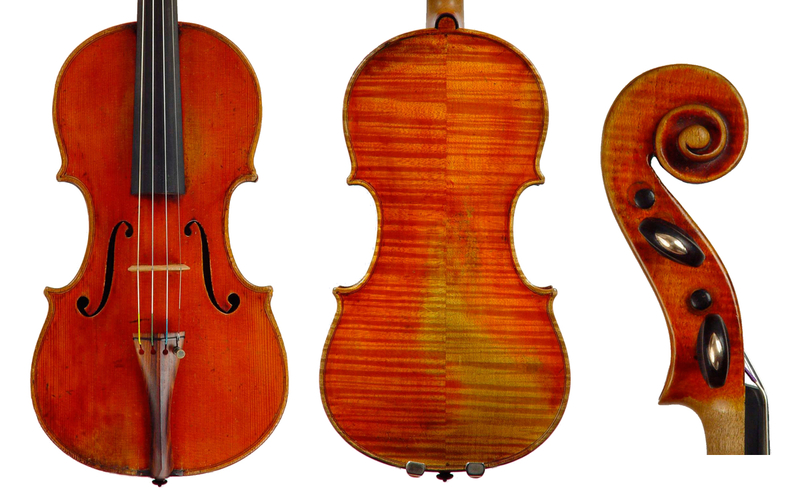 The corners are normally rather flat, short and triangular, much more in line with the Guarneri style than that of Stradivari. The purfling during this period can vary: at times it is quite wide and clear in the middle portion; at other times thinner with a fainter middle section. During the late 1880s, with his instruments in high demand, Postiglione began to import instruments in the white from Eastern or central Europe. Such works, probably aimed at the student and export markets, were somewhat altered in the workshop to reflect the Italian taste. Most of these still carry his original labels and the ornate brands (‘VP’) at the end button – generally at either end of an ebony insert. 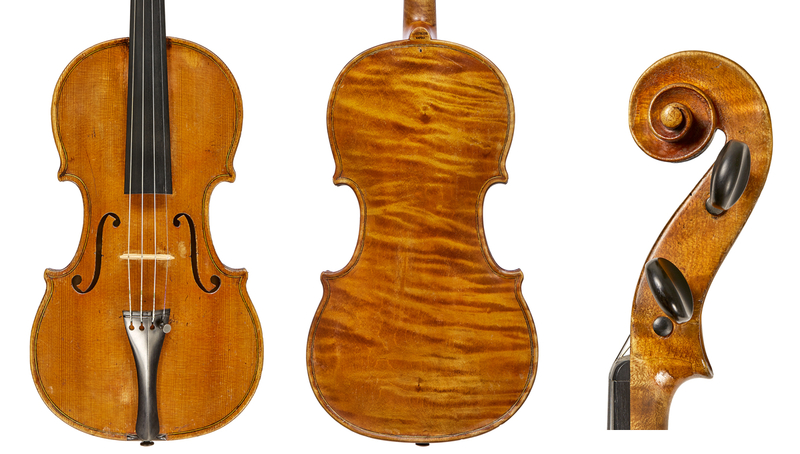 Postiglione’s instruments from this period and beyond are also branded on the back buttons, ‘V. Postiglione Napoli’. A masonic triangular symbol representing the Eye of Providence is seen on the labels or on the inner tops of many of his instruments. Postiglione also numbered his labels, but because many of his labels were later altered or replaced, his numbering system is difficult to decipher today. Postiglione’s most faithful and long-term pupil and assistant, Alfredo Contino, joined the workshop around 1902 at the age of 12. Several years later he became responsible for much of the workshop’s output; some of these instruments, made under his master or in collaboration with him, are backdated to suggest Postiglione’s earlier production. 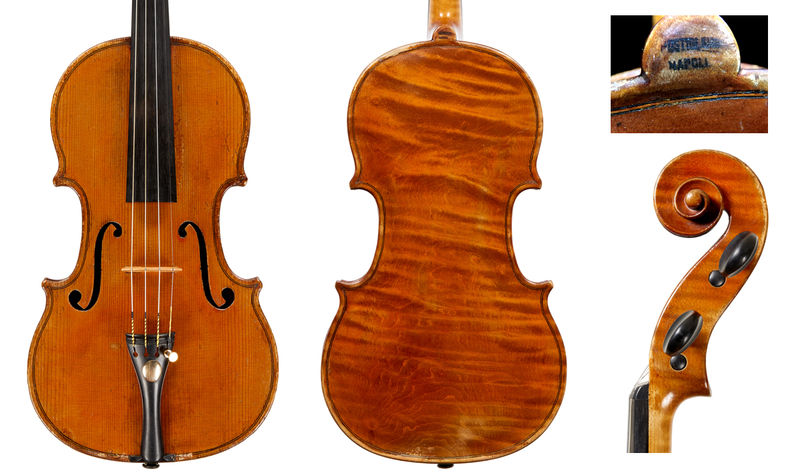 Contemporaneous with the ‘Contino type’, later Postiglione instruments, there are a number of violins made by Vincenzo himself that exhibit rougher yet more artistic workmanship than those Contino had essentially made for him. The instruments that bear the pupil’s hand often also have the Postiglione brands on the back buttons, a trait that Contino continued after Postiglione’s death, changing only the name on the brand to ‘A. Contino’. Vincenzo Annaruma was also apprenticed in the workshop during the same period, but soon left for Salerno. His heavier work has far less in common with that of his master than that of Contino. Around 1910 Postiglione retired, leaving the running of his shop to his sons, who surprisingly were not trained as violin makers. They continued to employ Contino to make instruments in the style of their father and bearing Postiglione’s original labels. 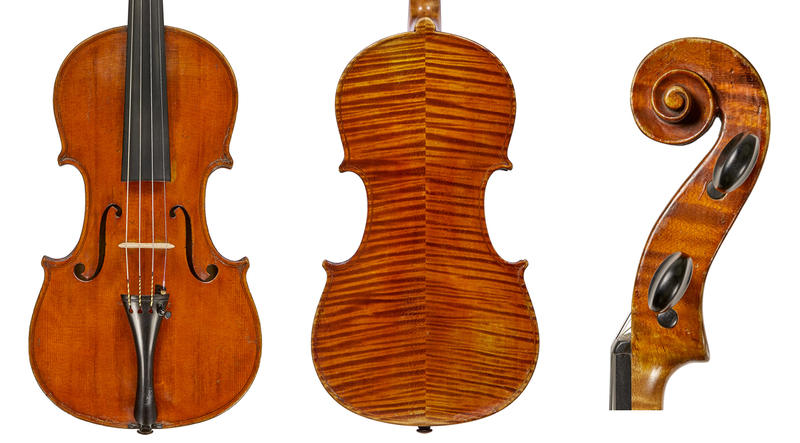 The hand of Contino in Postiglione’s instruments is clearly seen in his consistently upright, angular f-hole model, based on either the Stradivari or Guarneri pattern, and in his corner work. Whether in his superior work under Postiglione or later in his own, artistically generally less interesting instruments, Contino’s corners are normally slightly fluted, shorter and stubbier than those of his master and his neater purfling tends to end abruptly at the corners or in a very short and somewhat awkward bee-sting. In all, Postiglione violins number around 400. While some sources credit him with having made 60 violas, I have not encountered any from his own hand. He was, however, an assiduous cello maker, having produced over a hundred now highly sought-after examples. He was also one of the very few makers of the period to have significantly contributed to the viol family, having apparently constructed about 29 double basses, 9 violas d’amore and 14 viols. After Postiglione died in 1916 Contino succeeded him, continuing to work for many years very much in the style of his master. Although the overall quality of his work was inferior to that of his master and the instruments he had made for him, Contino’s standards remained quite high throughout the 1920s, with some estimable instruments made during those years. In his personally signed work, Contino’s outlines generally became more slender. From the 1930s onwards the quality of his workmanship and varnish gradually began to deteriorate. On his labels, in addition to stating that he was the only pupil of Postiglione, Contino makes mention of a prize he won in an exhibition in Rome. He appears to have retired from violin making during the 1950s and he died in the early 1960s. During his career he made about 300 violins, 70 cellos and 15 violas.